Where did this month go?! I feel like I JUST said happy new year! =( Time really does fly. 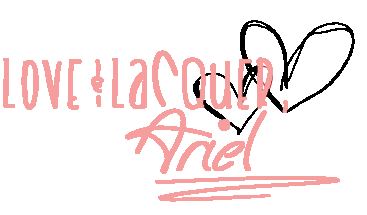 Today I have four stunners to show you from Initial Lacquer. All polish are hand-mixed with love, 3-free, and cruelty-free. First up is my favorite of the bunch: A Day at the Lake. This polish really does remind me of a lake! 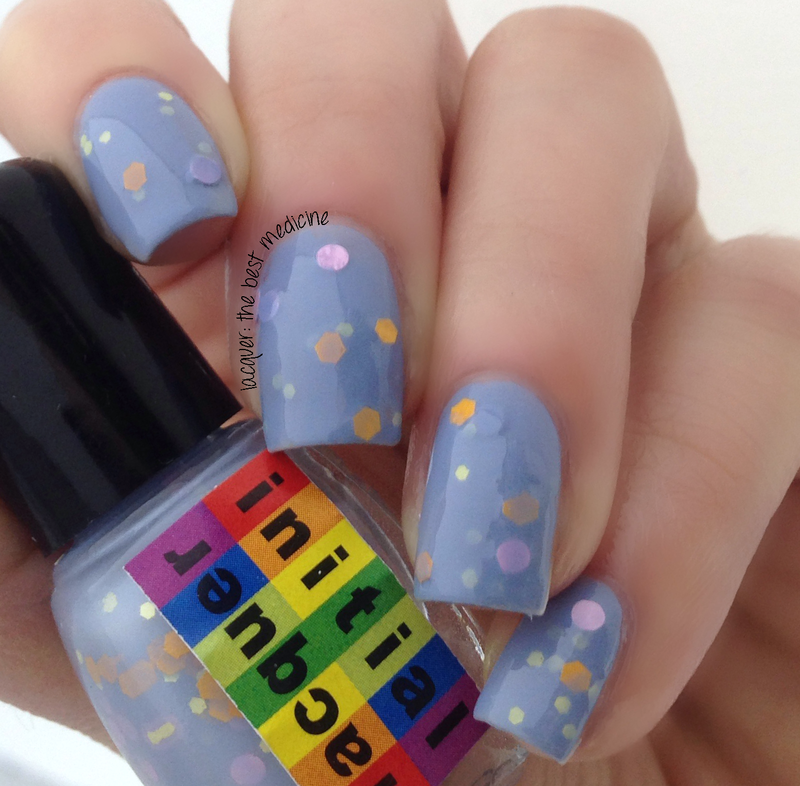 This polish is a lovely grayish-blue creme with matte glitters in pink (circles, YAY! ), yellow, and orange. This is a really, really, beautiful combination of colors. I had to fish a tiny bit for the pink circles, but I think it was because I had a mini bottle. Application was fairly easy aside from the glitter placement. Swatches show two coats of A Day at the Lake with Glisten & Glow HK Girl topcoat. Next up we have Pink Lemonade, a neon pink crelly (leans toward a creme) with various sizes of purple glitters. I love the way the purple glitters break up the pink. Application was great, as was the formula. This polish dries to a nice satin finish, but I used topcoat to smooth everything out. Swatches show two coats of Pink Lemonade with HK Girl. Next up is Mint Girl: a lovely mint green holo polish with some beautiful pink flakies in it. I had a really difficult time capturing the pink flakes, but trust me, they're there, and they're beautiful! The formula was a little bit thick, and if I weren't so lazy, I would have thinned it before swatching... but obviously it wasn't too thick to work with, because look how beautiful it is! 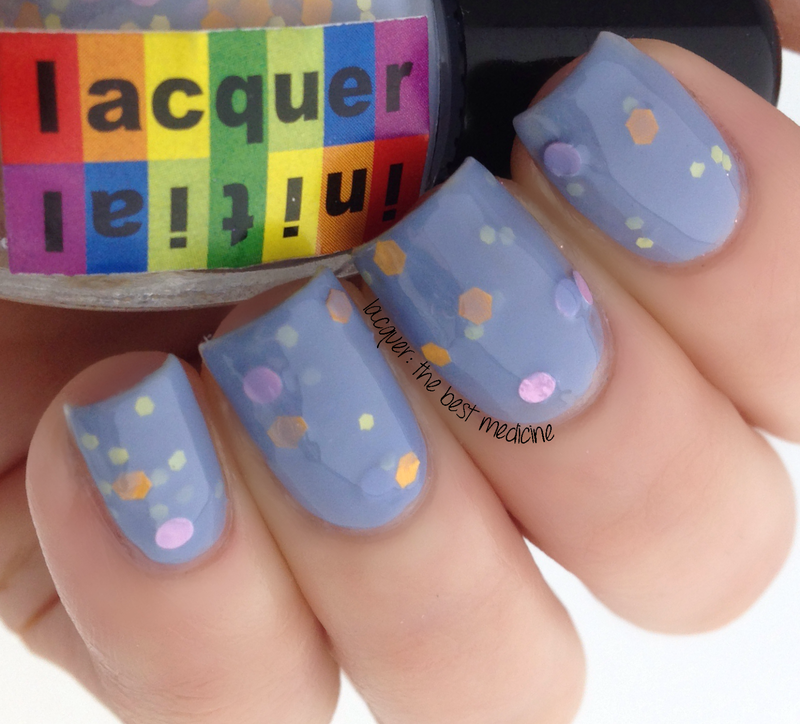 =) Swatches show two coats with HK Girl. The last polish I have for you today is Hint of Gold, a sheer, white crelly with a hint of gold shimmer (hence the name) and purple, blue, gold, and silver hexes in different sizes. This polish is pretty sheer, so I layered it over OPI My Boyfriend Scales Walls to make the glitter pop. I did have to fish for the bigger hexes in this one, which was expected. Swatches show 2 thin coats with HK Girl. What great shades! There all lovely but I think my favorite is Mint Girl.